The Kustom Signal Prolite Plus Binocular Style LIDAR is a compact, lightweight Speed Detection Unit and capable to be interfaced with PC. The Heads-Up Display (HUD) provides 1:1 viewing, without magnification, for precise vehicle targeting, less eye strain and exceptional target accuracy. When using the HUD you’ll see the target area and surrounding traffic and an illuminated aiming reticle to help you pinpoint your target. 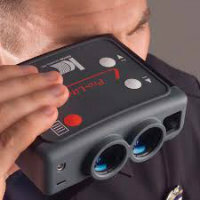 The "point-and-shoot" operation is ideal for motor officers or even foot patrol officers. With both eyes remaining open, this lightweight unit allows for hours of operation without eye strain or physical stress. 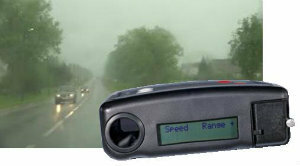 The environmental mode eliminates the effect of poor weather conditions when shooting. The selectable direction mode prevents unintentional acquisition of opposite lanes of traffic. It also has the capability of setting minimum and maximum target ranges. Measurements both in HUD and rear display. The I/O connector on the front side of the Pro-Lite+ provides a means to connect an external computer, data storage or Giant Display device to the instrument. 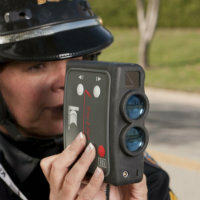 In a typical application, this might be used to display or store speed-readings from the Pro-Lite+. Protective overlays (housing and lenses) are Elastix polymer and the keypad is silicon rubber.